This weekend saw a failure and a success at our house. First, the failure. I really, really wanted to make some fabric Easter eggs like the ones I saw on Abbie's blog. So on Saturday, after much fighting with my computer and printer to print the pattern at the right scale and, having gotten it close but not quite right, finally resorting to a pencil and a ruler, I opened my big box of fabric scraps, a box that hasn’t been opened in far too long. I chose two fabrics, cut out the pieces, and sewed them together. As I started to stuff this egg wannabe, it was pretty clear that it wasn’t very eggy. But I kept at it, hoping that if I stuffed it full like the directions said, it would take on an ovate shape. Alas, I ended up with an Easter ball. I was pretty sure that the lack of egginess was due to my lack of sewing precision, so on Easter Sunday I tried again. The result, while more egg-like than the Easter ball, could in all honesty be described only as an Easter blob. I gave both the Easter ball and the Easter blob to the cats, telling them that the Easter bunny had brought them some new toys. They, having been up all night playing with the Easter eggs that had been carefully hidden all over the living room, knew I was lying. This effort, while it failed to produce the beautiful fabric eggs I was hoping for, was not a real failure. I rediscovered my scraps, reminisced about the projects they came from, and got inspired to open that box more often. I will keep trying with those eggs. If I start tomorrow, I’ve got 362 days to get them right. The success was much more exciting. Child Two finished her first embroidery project. 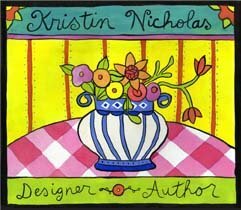 It’s from a great book called Kids’ Embroidery by Kristin Nicholas. We found it at the library but it’s so full of fun projects that we’ve ordered it. Kitty (as she’s called) is made from felt scraps left over from a Winnie the Pooh costume I made for Child Two long, long ago (at least I think it was for her and not for her brother, but finding out for sure would involve delving into the Photo Cupboard of Doom). We didn’t have any suitable colors of tapestry wool in the stash and BigName Craft Store doesn’t carry it (this is part of the reason we are on a quest for alternative supply sources), so we ended up getting Patons Astra for the yarn. It was a little too thick and it meant that I had to do all the needle threading, but it turned out fine. 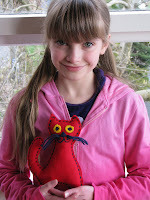 Child Two is very happy with Kitty, especially because she did all the stitching herself. The book shows one model made from an old wool coat. We’re going to keep an eye out for fun and funky fabrics to make some friends for Kitty. I also finished the purple scarf I started at the art gallery last month, but I couldn’t get a good picture of it. How I long for bright days, when my camera doesn’t ask for the flash for any close range photo! I’ll try again as soon as the sun comes out. OOOOH! If you are in search of fun and funky fabrics to let #2 make friends for Kitty, does that mean that I can be in search of fun and funky fabrics too? This "not buying anymore notebooks" and "use what you have" has completely diminished my shopping excursions. Tell #2 I LOVE Kitty. She did a great job. Oh my goodness - I found your blog via my "google alerts." What a lovely job your daughter did on that little kitty. The use of the knitting yarn is a great choice although it can be tough to pull through the felt. Look for needlepoint stores if you can, they usually sell tapestry yarn there. Love the kitty- too cute. It looks entirely professional! I will put that book on my to-get list. My little girl loves sewing. But as some of you know...it is a dangerous road for me! 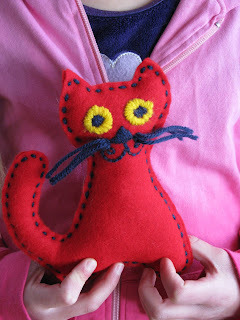 The kitty is so cute, and I love to see how it's done with scraps. How fun! !